Between online video, DVRs, and on-demand cable the amount of time people spend watching live TV (you know, with all of those commercials that advertisers spend $70 billion a year on) is shrinking fast. Only 52 percent of American’s viewing time is spent on live TV compared to online and time-shifting alternatives, according to a new survey of 1,000 American consumers by market research firm Morpace. 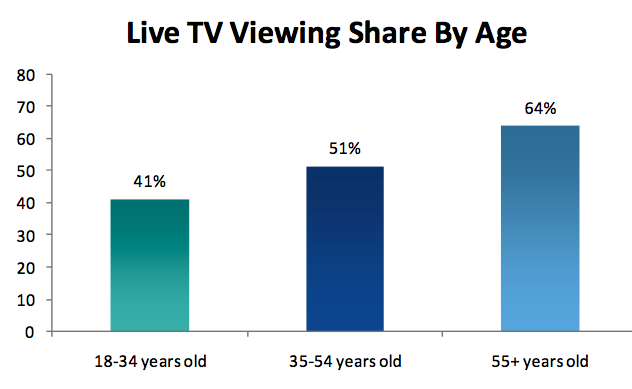 And that percentage decreases the younger the audience, with the key 18-to-34-year-old demographic watching live TV only 41 percent of the time, versus 64 percent of the time for those 55 and older. The alternatives to live TV are growing and basic cable is under assault, but no one single competing technology is taking over. People watch DVDs 14 percent of the time, online (including streaming video from services like Netflix) 13 percent of the time, saved programs on their DVRs 12 percent, and on-demand cable 6 percent. 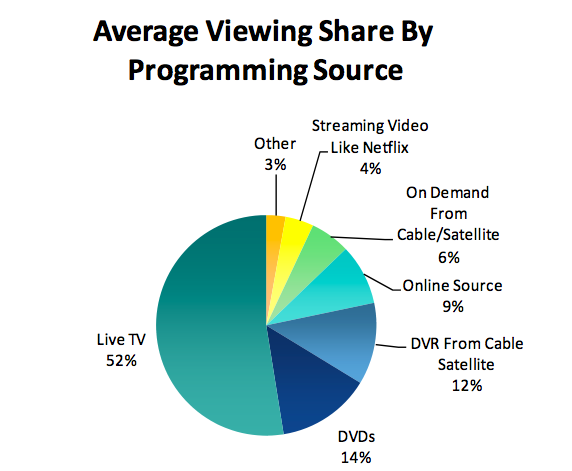 The survey breaks down online viewing into video from online sources like YouTube (9 percent) and streaming video from services like Netflix and Hulu (4 percent). For 18-to-34-year-olds, online video makes up 16 percent of their viewing time, and streaming video makes up another 7 percent. Those numbers are the share of all viewing time devoted to different channels. 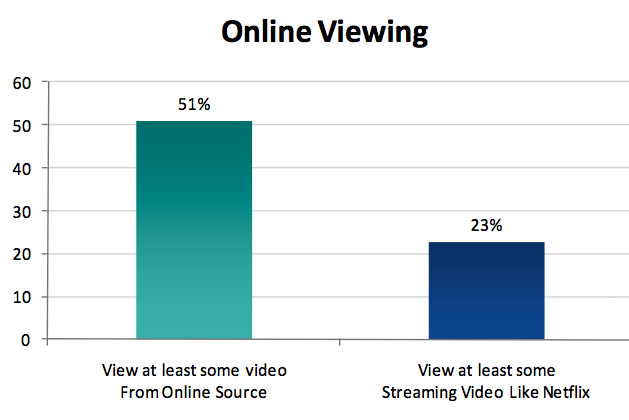 The share of audience who views ate least some online video is much larger. Half of all people surveyed (51 percent) watch at least some online video, and 23 percent watch at least some Netflix-like streaming video from the Internet. One of the major reasons viewing habits are changing is because people are watching video on a lot of different devices. 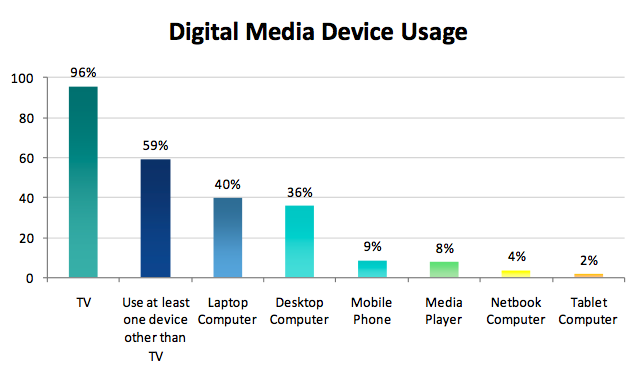 While 96 percent of respondents watch TVs, 59 percent use at least one other media-viewing device. These include laptops (40 percent), desktop computers (36 percent), mobile phones (9 percent), dedicated media players (8 percent), netbooks (4 percent), and tablet computers (2 percent).